Are you enjoying retirement or starting to figure out what you want your retirement to be? If so, there’s a good chance you’re going to want to figure out where you can live to gain the most enjoyment and satisfaction in your retirement. It’s important to find a location that is both affordable and will be fun to enjoy your retirement to the fullest. Living in a small town is a good option to consider for your retirement destination. Many upcoming retirees think of retiring to a big city but small towns actually have a lot of benefits and much to offer to retirees. In the past, a big drawback to retiring in small towns was the lack of modern amenities. Nowadays, most small towns have all the amenities big city residents don’t want to give up. When you move to a small town for your retirement, you won’t have to give up internet access, and with Amazon Prime type services, you can get just about anything delivered in a day or two. Therefore, moving to a small town will still allow you to enjoy these conveniences. In addition to offering modern conveniences, most small towns also offer a variety of shopping opportunities so you won’t have to travel that much to shop. Small towns also offer many types of restaurants, which have less of a hustle and bustle feel and more of a “family” type of environment as well as lots of cultural activities. Therefore, you can still enjoy a number of exciting activities when living in a small town. This is proven by the fact that many new Active Adult Communities are sprouting up in small locales. Without sacrificing modern conveniences, living in a small town can be more convenient since you won’t have to sit in traffic driving all over town for anything you might need because it’s all in one central place. 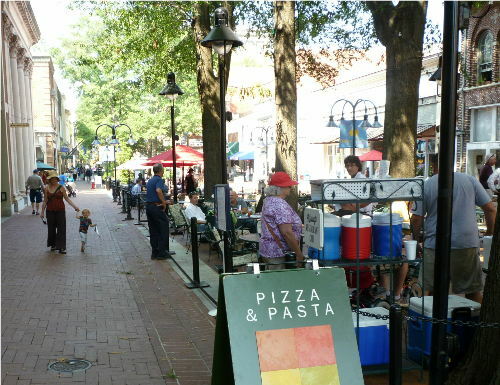 Small communities usually offer a higher quality of life than large cities. This is largely because of the sense of community you will enjoy while living in a small town combined with the slower pace. By living in a small community, you’ll avoid the hassle of lots of traffic which you don’t need in your golden years. In addition, you’ll be closer to nature since most small towns don’t have crowded streets, big buildings, with only a few parks here and there. Living in a small town even makes it easier for you to enjoy some of your favorite hobbies. Depending on where your small town is located, you can enjoy hunting or fishing on a regular basis. Or, you can play softball in your backyard or in the neighborhood park. You can even start your own vegetable or perennial garden in your own backyard. Retiring to a small community also makes it possible to relax and live safely. After all, small communities have much less crime than big cities. It’s possible to walk down the street without fear of being mugged or robbed and you can leave your doors wide open to catch a breeze without any fear. In general, your health will most likely improve due to the cleaner air in a small town. The lack of stress you’ll have when living in a small town will quickly make you healthier. Living in a small town is a relaxed and restful state of living. With a relaxed state, you’ll be able to maintain low blood pressure as well as reduce possible strain on your heart. you will be able to keep your blood pressure down and keep your heart healthy. Getting away from the hustle and bustle of the city is a welcome reprieve for any retiree. Although large city retirement communities can be a great choice for living during your retirement years, moving to a small town has advantages over this type of retirement living as well. For example, living in a small town allows you to still live within a mixed age community when you retire. For many retirees, the idea of living with only older individuals within a retirement community isn’t good. Most retirees prefer to live in a community full of all aged people so they can feel the energy of youth. By choosing to move to a small town rather than a retirement community, you’ll be able to acquire a piece of land that you wouldn’t be able to if you moved into a retirement community. Since homes located in small towns are less expensive than those in the urban areas, you’ll be able to get a bigger house and more land for the same amount of money. Small communities also offer a certain amount of charm that cannot be found in retirement communities or in large cities. There’s a good chance that in a small town you’ll see historic mansions and homes which have already been torn down in larger areas. This adds a cute charm to your daily life that is completely intangible yet fulfilling. These historic homes and buildings are in stark contrast to the modern suburban buildings and provide a blast from the past to relive childhood memories. Most of the larger Active Adult Communities are located in small towns on the edges of large metro areas. You get the best of both world with this setup. Although retiring to a small town may not be the right choice for everyone, many retirees find small town living to be the perfect way to live out their retirement years. Perhaps you are one of them!